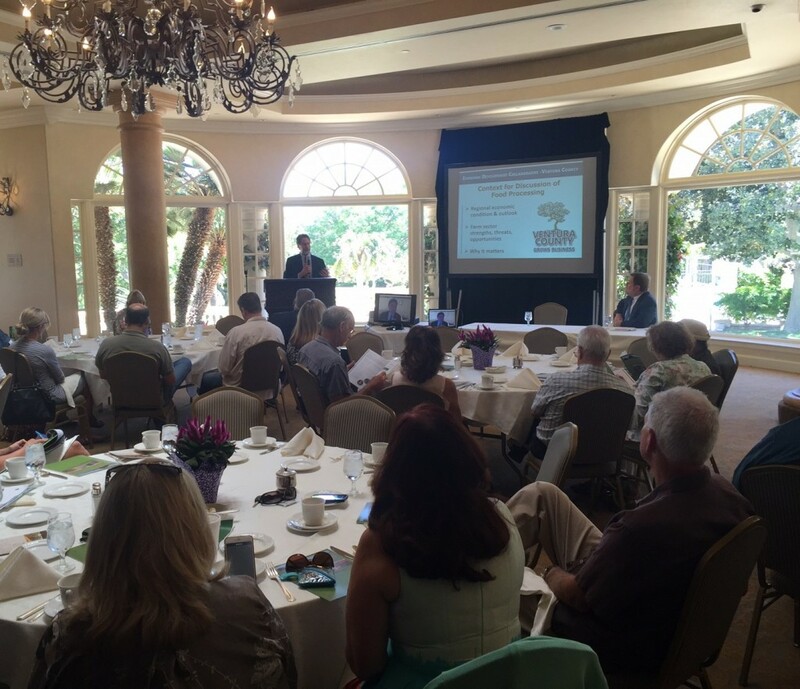 Our July Circle the Wagons forum was funded by the VC CoLAB Foundation to educate our members and supporters on potential opportunities for expanded agricultural processing in Ventura County. The “Dare to Dream” conference expressed hope that new, higher wage jobs could be created in the local agricultural industry. The benefits presented included reduction of truck traffic from local produce that is currently transported out of town for processing and the ability to take advantage of emerging market opportunities, improve local food security and help assure the long-term viability of the local AG sector. The idea began with a study by the Economic Development Collaborative of Ventura County (EDC-VC) identifying strengths, weaknesses, opportunities and threats to the Ventura County economy. The study was published in 2015 reporting that agriculture is a $3.3 billion industry, providing nearly 32,000 jobs, growing more than 50 crops with nearly the highest land value per acre in the U.S. The study also identified “nagging concerns” in the agricultural industry including stress in the labor market, uncertain water and infrastructure, uncertain positioning relative to emerging markets and an under-productive food processing component. Finding that Ventura County is 3 to 6 times under-invested in value-added agriculture compared to peer counties suggests opportunities to create 2680 jobs with the addition of a mere 223 acres of food processing facilities. Going straight to the source, we were fortunate to have the forum moderated by Bruce Stenslie, President and CEO of the EDC-VC, with participation by the two consultants responsible for preparing the study. Stenslie opened with the context for the study, followed by a presentation by Doug Svensson, CEO of Applied Development Economics, who flew down from Walnut Creek, CA, for our event. In addition, Lon Hatamiya, CEO of The Hatamiya Group, from Davis, CA, made comments and answered questions from the audience via Skype Video. We very much appreciate their participation and leadership on this issue. The discussions revealed that opportunities for food processing are different from the old model of the large distribution centers of the past that may not make economic sense in Ventura County. Svensson presented new models reflecting consumer demand for packaged “ready-to-eat” products including cut veggie sticks, berry purees, fresh salsa and guacamole. The study also proposes food-hubs to service local schools and restaurants with our abundant variety of local produce. In general the current limiting factors to such described processing is land use policy restricting food processing to industrial land. Industrial land in cities is too expensive for small scale facilities and in the county it is not available. Rules in the Ventura County Non-Coastal Zoning Ordinance preclude processing on agricultural lands that would involve bottling, canning, or supplementing with preservatives or coloring agents or chemical alteration. In a pre-meeting with County agencies including representatives of the County Planning Division and Environmental Health, CoLAB affirmed that restrictions in the zoning code and general plan land use policies had deterred agricultural operators from considering local processing as an option. Significant hurdles also include wastewater treatment, solid waste disposal and water supply. However, new package treatment wastewater systems are becoming more cost effective and the evolving technology will likely present new solutions in the future. Svensson closed with compelling reasons to promote expanded food processing in Ventura County. By securing long term benefits for growers and creating new job opportunities, the greenbelts that contribute to our quality of life would be supported. Countywide economic projections indicate a potential of $356 million in total value added, a $1.3 billion expansion of the economy and a one-third expansion of the agricultural cluster without increasing farm production. CoLAB agrees that a limited number of facilities located on agricultural lands that have been marginalized by lack of water, parcel size and/or conflicts with urban neighbors could be a win-win for farmers and the community.